I'm always on the hunt for cute neutral colored bags. They looks so clean and sleek, and go with everything. Don't get me wrong, I love colors too. Neutral bags are just more of a wardrobe staple. I have selected some of my favorites from omgnb.com. They are all very affordable too. The first one that I am showing you is this studded backpack. I am really into backpacks at the moment because I think they are super convenient and refreshing. I love how this one looks. I really just like everything about it. The little dot studs are fun. 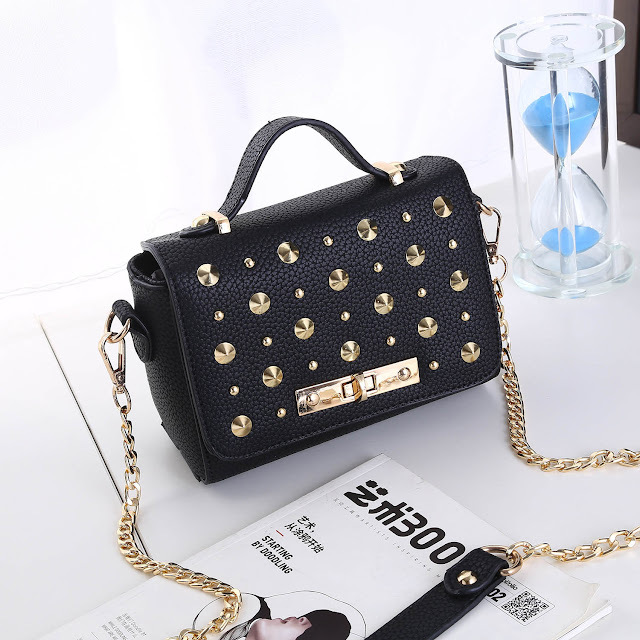 The next bag is this black one. It's another studded bag. I guess I am just loving studs at the moment. This one just looks like it would be expensive, but it isn't. They also have it in several different colors. I like most of the other colors but this black one would go with the most. It's just perfect for winter. The third bag is an very unusual shape. I love how unique it looks. It's also the prettiest shade of grey. It kind of reminds me of the shape of some popular designer bags. I can't pinpoint exactly which designers I am thinking of but maybe you know what I mean. This one also comes in multiple colors. White is a good color bag to have. I have a few white bags and I use them all the time. They are good to wear with lighter colors, when you don't have a bag that really matches. This one is small and cute. It seems like it would be perfect to just carry around your money and a cell phone. It seems perfect for a night out. I have some similar bags and I love them. Omgnb.com has a large variety of items to shop. Aside from purses, they also have shoes, beauty products, and intimates. They are all affordably priced. There are several pairs of shoes that I love too. Be sure to check out that category if you have time.